The plasminogen activator inhibitor-1 (PAI-1) spontaneously converts from an inhibitory into a latent form. Specificity of PAI-1 is mainly determined by its reactive site (Arg346-Met347), which interacts with serine residue of tissue-type plasminogen activator (tPA) with concomitant formation of SDS-stable complex. Other sites may also play roles in determining the specificity of PAI-1 toward serine proteases. 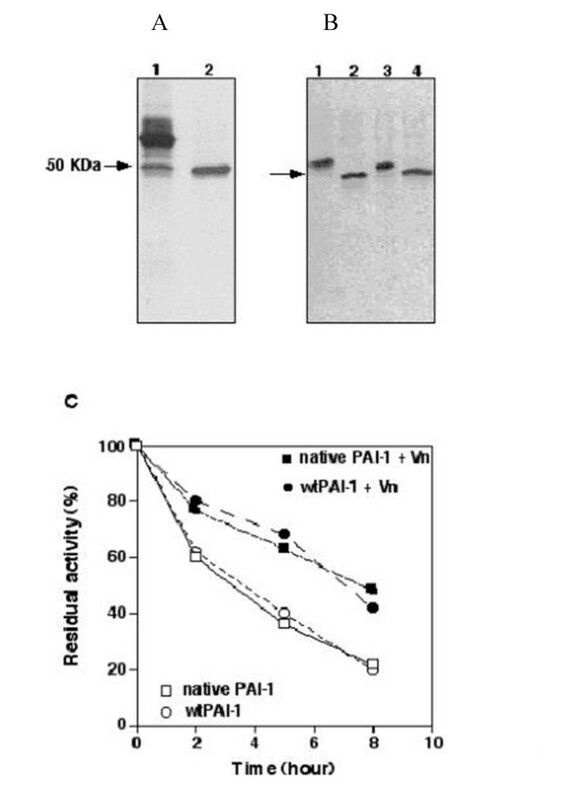 To understand more about the role of distal hinge for PAI-1 specificities towards serine proteases and for its conformational transition, wild type PAI-1 and its mutants were expressed in baculovirus system. WtPAI-1 was found to be about 12 fold more active than the fibrosarcoma PAI-1. Single site mutants within the Asp355-Arg356-Pro357 segment of PAI-1 yield guanidine activatable inhibitors (a) that can still form SDS stable complexes with tPA and urokinase plasminogen activator (uPA), and (b) that have inhibition rate constants towards plasminogen activators which resemble those of the fibrosarcoma inhibitor. More importantly, latency conversion rate of these mutants was found to be ~3–4 fold faster than that of wtPAI-1. We also tested if Glu351 is important for serine protease specificity. The functional stability of wtPAI-1, Glu351Ala, Glu351Arg was about 18 ± 5, 90 ± 8 and 14 ± 3 minutes, respectively, which correlated well with both their corresponding specific activities (84 ± 15 U/ug, 112 ± 18 U/ug and 68 ± 9 U/ug, respectively) and amount of SDS-stable complex formed with tPA after denatured by Guanidine-HCl and dialyzed against 50 mM sodium acetate at 4°C. The second-order rate constants of inhibition for uPA, plasmin and thrombin by Glu351Ala and Glu351Arg were increased about 2–10 folds compared to wtPAI-1, but there was no change for tPA. The Asp355-Pro357 segment and Glu351 in distal hinge are involved in maintaining the inhibitory conformation of PAI-1. Glu351 is a specificity determinant of PAI-1 toward uPA, plasmin and thrombin, but not for tPA. PAI-1 shares a 35% homology with 40 other serpins. The X-ray structure of active PAI-1 [11, 12] consists of three sheets (A-C), nine helices (a-i) and a reactive center loop (RCL). The RCL contains the residues Ser331 to Arg356 (P16-P10'), and within it there is a peptide loop (Glu 351 to Pro 357, P5'-P11'), which is defined as the distal hinge (Table 1). It should be noted that the placement and conformation of the RCL in active PAI-1 is quite different from that of latent PAI-1. The movement of the distal hinge and the insertion of the RCL into sheet A as strand 4A (s4A) should take place during the transition from the active into the latent form of PAI-1. The catalytic center of tPA interacts with the reactive site of PAI-1 with concominant formation of 1:1 molar, SDS-stable complex. The P1 (Arg346) residue in the RCL of PAI-1 is an essential determinant for its target specificity and inhibitory activity. [14, 15] Since many serpins with identical amino acid residue at P1 position display different specificities, it is unlikely that the P1 residue is the sole determinant for target protease specificity, other regions of PAI-1 may also affect its specificity toward target proteases. The variable region in serine proteases domain determines their specificity for PAI-1. Alignment of variable region 1 of the serine proteases shows a remarkable correlation between the composition of this area and their susceptibility to inhibition by PAI-1 as shown in Table 2. Both tPA and uPA, the target proteases of PAI-1, contain a relatively extensive variable region 1, consisting of four to five positively charged amino acid residues present at identical position. Plasmin and thrombin with moderate reactivity toward PAI-1 have relatively short variable regions which contain only two to three positively charged residues. For example, positively charged amino acids in the variable region of tPA, uPA and thrombin play dominant roles in the specific interaction with PAI-1. [17–19] Furthermore, Glu350 (P4') of PAI-1 has been shown to mediate the interactions with tPA. Alignments of the amino acids sequences of the first variable region and parts of the surrounding constant regions of the protease domain of tPA, uPA, plasmin and thrombin. In the variable region positively charged amino acid residues are underlined. In this study, By producing wtPAI-1 and several single site mutations in the distal hinge of PAI-1 in a baculovirus expression system, we were able to find out the role of the distal hinge in conformational transition of PAI-1 and to elucidate the role of Glu351 in PAI-1 for serine protease specificities. To confirm the validity of recombinant PAI-1 as a model to study the native inhibitor secreted from human fibrosarcoma cells, we compared the recombinant PAI-1 and the fibrosarcoma PAI-1 first by SDS-PAGE and immunoblot with anti-PAI-1 monoclonal antibodies. The molecular weight of wtPAI-1 was found to be lower than native PAI-1 (~50 kDa, Fig. 1B). We assumed that this is due to a lower (probably different) extent of glycosylation in the baculovirus expression system. Indeed, when both proteins were deglycosylated with N-glycanase they were found to have an essentially identical M.W. (~48 kDa) and to cross-react immunochemically (Fig. 1B). Furthermore, when this wtPAI-1 was chromatographed on heparin-Sepharose it was found to be > 98% pure by silver staining of the gel (Fig. 1A lane 2). Purification and characterization of wtPAI-1. Panel A, Purification of wtPAI-1. The medium from High five cells was harvested 48 hours post infection and PAI-1s were purified on a heparin-Sepharose column and stained as described under Methods. Lane 1, the medium from infected High five cells, lane 2, wtPAI-1 eluted from the heparin-Sepharose column. Panel B, Treatment of fibrosarcoma- and wtPAI-1 with N-glycanase as described under Methods. Lane1 and 2 were fibrosarcoma PAI-1, lane 3, and 4 were wtPAI-1. Fibrosarcoma PAI-1 (lane 2) and wtPAI-1 (lane 4) were treated with N-glycanase. Panel C, Stability of fibrosarcoma PAI-1 or of wtPAI-1. Fibrosarcoma PAI-1 or wtPAI-1 was incubated (37°C) in the absence (empty circle and square) or in the presence of a two molar fold of vitronectin (filled circle and square) in PBS. At the indicated time periods, aliquots were removed and the inhibitory activity of the PAI-1s towards uPA was measured as described under Methods. The inhibitory activity prior to the incubation at 37°C was taken as 100%. Interestingly, the specific inhibitory activity of wtPAI was 63 ± 15 U/ug just after purification, and was increased to 84 ± 21 U/ug after denatured by 6 M Gdn-HCl and refolded in 50 mM sodium acetate (pH 5.6) at 4°C. In contrast, the specific activity of the fibrosarcoma PAI-1 was only 5 ± 3 U/ug before activation, and was only increased to 45 ± 16 U/μg after denaturing and refolding. The high specific inhibitory activity of wt-PAI-1 could be due to the fact that it was secreted from insect High-5 cells cultured at 27°C, while the fibrosarcoma preparation of PAI-1 was obtained from the medium of fibrosarcoma cells cultured at 37°C . Exposure to the higher temperature could accelerate the conversion of the inhibitor into its latent form. The functional stability of wtPAI-1 and the fibrosarcoma PAI-1 in the absence or in presence of vitronectin are illustrated in Figure 1C. wtPAI-1 lost its inhibitory activity at the same pace as the fibrosarcoma PAI-1, indicating that its functional half life as an inhibitor and its ability to be stabilized by vitronectin are similar to those of the fibrosarcoma PAI-1. The second-order rate constants (in M-1s-1 units) of the fibrosarcoma PAI-1 and the wtPAI-1 towards t-PA were 1.4 ± 0.5 × 107 and 1.7 ± 0.6 × 107, and towards uPA were 4.1 ± 1.4 × 107 and 4.4 ± 1.6 × 107, respectively. These results show that the wtPAI-1 could inhibit tPA or uPA at the same rate as the fibrosarcoma PAI-1. In addition, it is known that PAI-1 inhibits either tPA or uPA by forming a 1:1 SDS stable complex , wtPAI-1 indeed could form SDS stable complex with tPA or uPA (Fig. 3A) just as fibrosarcoma PAI-1. The specific inhibitory activity and functional stability of wtPAI-1, D355P, R356P and P357G Panel A: The specific inhibitory activity of wtPAI-1, D355P, R356P and P357G towards uPA was measured immediately after their purification and after their activation with 6 M Gdn-HCl as described under Methods. The data represent the mean ± SEM of three separate determinations. Panel B: wtPAI-1, D355P, R356P and P357G were incubated in PBS at 37°C. At the indicated time periods, aliquots were removed and the inhibitory activity of the PAI-1s towards uPA was measured as described under Methods. The inhibitory activity prior to the incubation at 37°C was taken as 100%. Since a proline occurs not only in position 357 of PAI-1, but also in the corresponding position of several other serpins (Table 1) we attempted to find out how does a mutation of P357 affect the inhibitory activity of PAI-1. 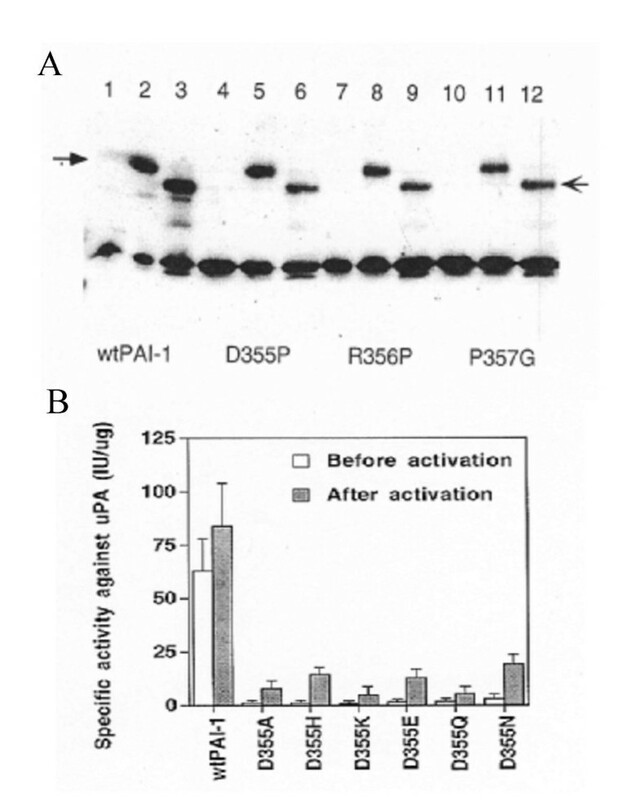 Mutant of Pro357Gly blocked the inhibitory activity of PAI-1 (Fig. 2A). Similarly, a mutation into proline of either Asp355 or Arg356 also inactivated the inhibitor. It should be noted that all these mutants could be activated to a similar extent by 6 M Gnd-HCl (~20% inhibitory activity of the wtPAI-1, activated under the same conditions). These results suggest that a single site mutation at either one of the positions 355, 356 or 357 significantly inactivates PAI-1. Complex formation and specific inhibitory activity of PAI-1s Panel A: The PAI-1s were incubated for 30 min at 37°C in the absence or in the presence of a two molar excess of either single-chain tPA or uPA. They were then subjected to SDS-PAGE and immunobloting using anti-PAI-1 monoclonal antibodies. Lanes 1, 4, 7, 10 are PAI-1s only, lanes 2, 5, 8, 11 are PAI-1s with tPA, and lanes 3, 6, 9, 12 are PAI-1s with uPA. The filled arrow indicates the complexes between PAI-1s and tPA, and the regular arrow indicates the complex between PAI-1s and uPA. Panel B: The specific inhibitory activity of D355A, D355H, D355K, D355E, D355Q, and D355N towards uPA was measured immediately after their purification and after their activation with 6 M Gdn-HCl as described under Methods. The data represent the mean ± SE of three separate determinations. To elucidate the mechanism through which such mutations affect the activity of PAI-1, we determined their effect on the functional stability of PAI-1 and on its ability to form an SDS stable complex with either tPA or uPA. As seen in Fig. 2B, the rate of the spontaneous inactivation of the inhibitor was significantly increased upon mutation: the functional half life of the mutants Asp355Pro, Arg356Pro and Pro357Gly was 23.8 ± 4.5 min, 26.2 ± 3.7 min and 24.7 ± 4.8 min, respectively, while that of wtPAI-1 was 89.8 ± 8.7 min. Interestingly, there was no significant difference between the mutants tested and the wtPAI-1 in their ability to inactivate either tPA or uPA (Table 3). They could also form SDS-stable complexes with tPA or uPA just as well as wtPAI-1 (Fig. 3A). Second-order rate constants of wtPAI-1, D355P, R356P, P357G toward tPA or uPA. The second-order rate constants of inhibition, expressed in M-1 s-1 were determined as described in the Materials and Methods section. Values are averages of at least four independent experiments. An interesting structural similarity among several serpins is known to occur at the position corresponding to 355 in PAI-1. While in PAI-1 this position accommodates a negatively charged aspartic acid residue, in other serpins it sometimes accommodates its non charged analog asparagine (Table 1). Asp355His, Asp355Lys, Asp355Glu, Asp355Gln and Asp355Asn were prepared and used to show that the negatively charged aspartic acid in PAI-1 is essential (though not sufficient) for its inhibitory activity. Mutation of Asp355 by asparagine (the non charged analog of aspartic acid), or by histidine or lysine (that have a positively charged side chain) or by alanine (neutral), inactivated PAI-1. Replacement of this aspartic acid residue even by the negatively charged glutamic acid (a very close analog of aspartic acid) did not significantly suffice to restore a full inhibitory activity of PAI-1 (Fig. 3B). After activation with 6 M Gnd-HCl, each of the six mutants exhibited a relatively high inhibitory activity, but their specific activities were still much lower than that of wtPAI-1 (Fig. 3B). Among them, Asp355Lys (5.1 ± 4.1 U/ug) had the lowest specific activity, while the Asp355Asn (20 ± 4.2 U/μg) had the highest specific activity (Fig. 3B). 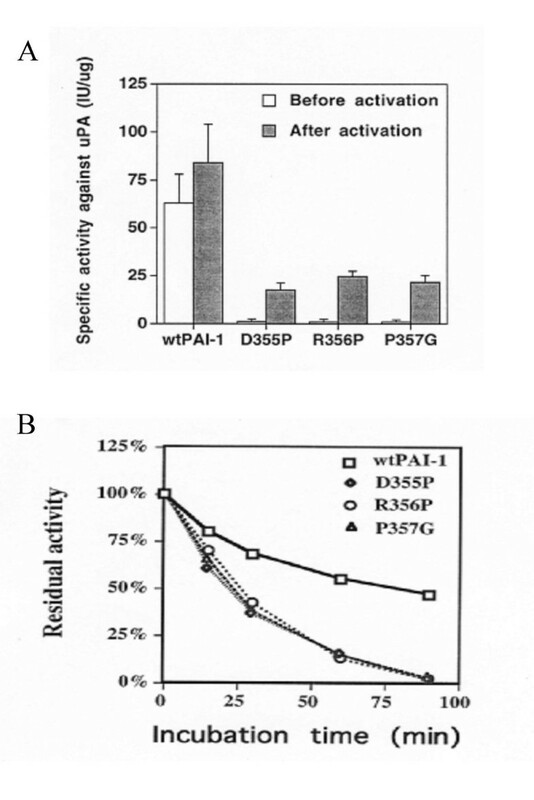 Although they had lower specific activities, all of the mutants mentioned above could still form SDS-stable complexes with tPA or uPA just as the wtPAI-1 (data not shown). Two additional mutations, Arg356Ala and Arg356Glu, were prepared to further elucidate the role of Arg356. The specific inhibitory activity of Arg356Ala was 7.2 ± 2.5 U/μg, while Arg356Glu exhibited essentially no inhibitory activity. This specific activity was increased to 35.4 ± 8.7 U/ug for Arg356Ala and 6.4 ± 2.3 U/μg for Arg356Glu after denature and refolding. Just like ARG356Pro, Arg356Ala and Arg356Glu were much more labile than wtPAI-1. These results suggest that the role of the Asp355-Pro357 segment is to stabilize the inhibitory conformation of PAI-1. The specific inhibitory activities of wtPAI-1, Glu351Ala and Glu351Arg were assessed with uPA and S-2444. As shown in Fg. 4A, the specificity of wtPAI-1, Glu351Ala and Glu351Arg after denatured by 6 M Gdn-HCl and dialyzed against 50 mM sodium acetate, pH 5.6, was 84 ± 15, 112 ± 18 and 68 ± 9 U/ug, respectively. Glu351Ala had a higher, and Glu351Arg lower specific activity than wtPAI-1. The specific activities of PAI-1s determined immediately after purification displayed similar pattern as that of inhibitors reactivated. There was about 15–20% increase after reactivation compared to each untreated protein itself. As shown in Fig. 4B, the two mutants also spontaneously lost their inhibitory activity(convert to latency) as wtPAI-1, but at different rates. The functional stability of wtPAI-1, Glu351Ala, Glu351Arg was about 18 ± 5, 90 ± 8 and 14 ± 3 minutes, respectively. It suggested that the specific activities measured above, to some extent, proportionally represent the functional stability. More importantly, amount complexes formed by tPA and PAI-1s remained after incubation at 37°C (Fig. 4C) were proportionally concordant with the results obtained from enzymatic stability assay (Fig. 4B). This proves that results from enzymatic assay are valid. The result of functional stability suggests that Glu351 is indeed involved in the conformational transition of PAI-1. Specific activity, functional stability an complex formation of E351A and E351R Panel A, Specific activities of wtPAI-1 and mutants were measured by a direct chromogenic assay using uPA and substrate S-2444 in microtiter plate as described under Methods. One unit of PAI-1 activity is defined as the amount that completely neutralizes 1 U of u-PA. Panel B, wtPAI-1, or mutants in assay buffer were incubated at 37°C. At times indicated, aliquots were taken out and determined their activity immediately as described above. The specific activity obtained at time zero was assigned a value of 100%. Panel C, complex formation of PAI-1s with tPA: certain amount of wtPAI-1, E351A and E351R were incubated with equal amount of tPA at 37°C for 30 minutes before put on ice, at same time these PAI-1s were incubated in PBS at 37°C for 3 hrs, respectively, before they were incubated with same amount of tPA at 37°C for 30 minutes, then the protein samples prepared at two time points were subjected to SDS-PAGE, and probed the membrane blot with anti-PAI-1 monoclonal antibody. Lane1, 2 and 3 for wtPAI-1, E351A and E351R at zero time point, lane 4, 5, 6 for wtPAI-1, E351A and E351R after 3 hours' incubation at 37°C. Both mutants inhibited thrombin more efficiently than wtPAI-1, more importantly, Glu351Ala was better than Glu351Arg in inhibiting thrombin (Fig. 5A); Inhibition of thrombin by Glu351Arg was almost as same as by Glu351Ala in presence of vitronectin (Fig. 5B), which facilitated the thrombin inhibition by both mutants. When excess equal amount of thrombin was incubated with equal amount of PAI-1s in term of inhibitory activity against uPA, mutant inhibitors were neutralized faster by thrombin than wtPAI-1, and vitronectin also facilitated the neutralization of Glu351Ala or Glu351Arg by thrombin, just similar to the wtPAI-1 (Fig. 5C). Inhibition of thrombin by wtPAI-1, E351A and E351R and Neutralization of PAI-1s by thrombin Thrombin (50 ul, 0.5 U/ml) was incubated with equal amount of wtPAI-1, E351A, or E351R in term of inhibitory activity toward uPA (panel A), or in presence of vitronectin(panel B). After 20, 40, 60 and 120 min, remaining thrombin activities were determined with S-2238. The initial activity of thrombin was taken as 100%. Panel C, Forty nanomolar of thrombin were incubated with 10 nM of active PAI-1 alone, or in presence of 40 nM vitronectin at 37°C. After 30 min, residual PAI-1 activity was determined by titration on uPA. The residual PAI-1 activity without incubation with thrombin was taken as 100%. Empty bars, PAI-1s, filled black bars, PAI-1s + thrombin, and filled light bars, PAI-1s + thrombin + vitronectin. 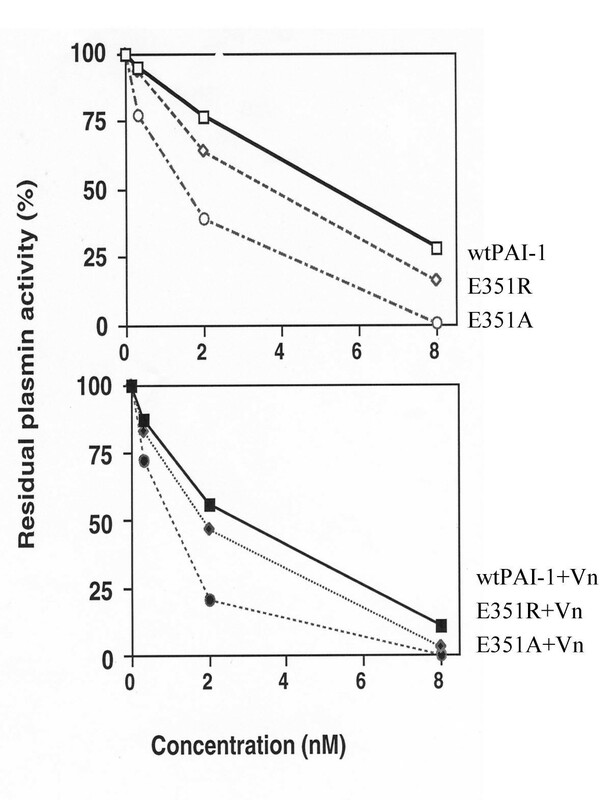 When plasmin was incubated with increased amount of equal active PAI-1s in absence or in presence of vitronectin, it was inhibited faster by mutants than by wtPAI-1 (Fig. 6 upper panel); and both of mutant also displayed improved inhibition toward plasmin in presence of vitronectin (Fig. 6 lower panel). 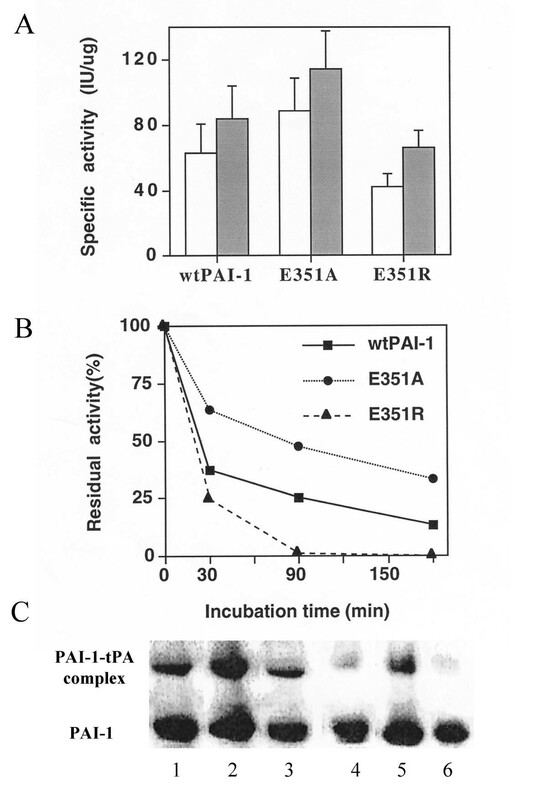 Inhibition of plasmin by wtPAI-1, E351A and E351R Plasmin (50 ul, 100 nM) was incubated with equal amount of wtPAI-1, E351A, or E351R alone in term of inhibitory activity toward uPA (0, 0.32, 1.6 and 8 unit in 50 ul, respectively, upper panel), or in presence of two molar excess of vitronectin(lower panel). Residual plasmin activity was calculated according to the absorbance at 405 nm after 60 minutes incubation with plasmin substrate (final concentration, 0.5 mM). The activity of plasmin without PAI-1s was taken as 100%. The rate constants of tPA for wtPAI-1, Glu351Ala and Glu351Arg were similar (Table 4), however, The rate constants of inhibition toward uPA by Glu351Ala and Glu351Arg were 4 and 7-fold higher than by wtPAI-1, respectively. Moreover, The rate constants of Glu351Ala and Glu351Arg for thrombin inhibition were 2 to 4 folds higher than that of wtPAI-1 and rate constants of Glu351Ala and Glu351Arg to plasmin were 2 fold higher than that of wtPAI-1. This indicates that Glu351 is not essential for the interaction with tPA, but it is an very important determinant for the optimal interaction with uPA, thrombin and plasmin. The second-order rate constants of wtPAI-1, E351A and E351R towards tPA, uPA, plasmin and thrombin. The validity of human recombinant wtPAI-1 in representing the physiological form of the inhibitor is shown here by the following: (a) The inhibitory activity of this wtPAI-1 is actually higher than the inhibitory activity of the PAI-1 isolated from fibrosarcoma cells (12 fold more inhibitory prior to activation by 6 M Gnd HCl, and 2 fold more inhibitory after activation); (b) The inhibition rates of both tPA and uPA obtained with wtPAI-1 are essentially identical to those obtained with PAI-1 secreted by fibrosarcoma cells; (c) wtPAI-1 forms SDS-stable complexes with tPA and uPA that are similar to those obtained with the fibrosarcoma PAI-1; (d) The stabilization of the inhibitory conformation of wtPAI-1 by vitronectin is essentially identical to that of the fibrosarcoma PAI-1; (e) The molecular weight of the protein moiety of wtPAI-1 is similar to that of the fibrosarcoma PAI-1, if the two inhibitor preparations are deglycosylated with N-glycanase. In view of the above, we used mutated recombinant PAI-1s to assess the importance of specific amino acid residues in the inhibitory function of PAI-1. This study focuses on the functional role of Glu351, Asp355, Arg356 and Pro357 within the distal hinge region of PAI-1. We suspected that the "bending" property of the prolyl residue at position 357 and the rigidity in the polypeptide backbone imposed by prolyl residues in general might have a role in maintaining the inhibitory conformation of this segment. Indeed, we found that a mutant of Pro357 in which the proline residue was replaced by glycine is non inhibitory. This mutant could, however, be activated by 6 M Gdn-HCl, supporting the notion that the lack of activity of Pro357Gly may indeed be due to a conformational effect on the structure of the inhibitor. The structural importance of the local conformation of the Asp355-Pro357 segment is further illustrated by two single site mutants in which the original Pro357 was preserved, but an additional proline residue was introduced (by mutation) at positions 355 or 356. These two mutants were inactive but they were activated considerably by treatment with 6 M Gdn-HCl. The enhanced lability of these mutants was evident from a more rapid conversion into their latent structure. These mutants were found to form SDS-stable complexes with either tPA or uPA after treatment with 6 M Gdn-HCl. This treatment presumably allows them to restore (at least in part) their inhibitory structure, and their ability to inhibit plasminogen activators with second order rate inhibition constants similar to those obtained with the wtPAI-1. Since these mutants have faster latency transition time, we assume that these mutations do so by loosening the structural restrictions normally imposed on the mobility of the RCL. However, we show here that in spite of the fact that these mutants are structurally more fragile, their second-order rate constants towards their target proteinases are very similar to those of wtPAI-1. This implies that a facilitated latency transition does not necessarily result in slow rate inhibition towards tPA or uPA. This is in line with the findings that stable PAI-1 mutants (72-fold or 245-fold longer half life than of wtPAI-1) have similar inhibition rate constants towards uPA. [22, 23] We therefore conclude that the segment Asp355-Pro357 is not involved directly in the complex formation, but rather in the latency transition. The results presented here with the mutants expressed in High 5 cells show that indeed the conversion of the negative into a positive charge (Asp355His and Asp355Lys) yields an inactive inhibitor protein, but the preservation of the negative charge does not suffice by itself. Mutation of this aspartic acid residue into a negatively charged glutamic acid (also negatively charged, and differs from Asp355 by having an extra methylene group only) still yields a mutant PAI-1 that has a very low inhibitory activity. The fact that the negative charge is an important factor in the inhibitory activity is illustrated here by the finding that Asp355Asn and Asp355Gln have both a very low activity, yet they are more active than Asp355Lys and Asp355His. Generally speaking, it is clear from our studies that any mutation of Asp355, whether it preserves the negative charge or not, yields an inactive inhibitor. Improvements in specificity of mutants for uPA indicates that Glu351 involve in the interaction with uPA. To the best of our knowledge, this is the first time that the specificity of PAI-1 toward uPA is partially mediated by the negatively charged residue located in the C-terminal of cleavage site in PAI-1. The interaction of Glu351 with uPA is much more important than that of Glu351 with tPA, which is demonstrated by improved reactivity of Glu351 mutants toward uPA, but not toward tPA, showing that tPA is not directly interact with Glu351 of PAI-1, whereas Glu351 is necessary for the optimal interaction with uPA. Our results are concordant with previous study,  which suggests that serpin body-protease body interactions play significant roles in determining serpin inhibitory activity against target proteases. Substitution of Glu351 also altered the specificity toward non-cognate proteases: plasmin and thrombin. Glu at 351 may provide steric hindrance that slows the rate of thrombin or plasmin inhibition. Mutations at Glu351 may decrease the original repulsive interactions with variable region of thrombin, which may slow the rate of thrombin inhibition, or results in favorable interactions that may not exist when wtPAI-1 react with thrombin. So, both Glu351Arg and Glu351Arg are better thrombin inhibitors than wtPAI-1. Similar results were observed for plasmin. With single mutation at position Glu351, we improved reactivity of PAI-1 to thrombin and plasmin without significantly affecting its specificity to tPA. This substantiates previous mutagenesis studies, which demonstrated that repulsive interactions and/or lack of productive electrostatic interactions between Glu39 and Glu192 of thrombin and PAI-1 are responsible for the slow reaction of thrombin with this serpin. Furthermore, the rapid inhibition of plasmin requires a non-covalent interaction between an amino-terminal site of plasmin and a carboxyl-terminal on anti-plasmin, and a second site outside the RCL of PAI-1 contributes to its specific interaction with proteases. [15, 27] The specificity of the two mutants toward thrombin and plasmin implicates that Glu351 of PAI-1 is involved in its specificity toward thrombin and plasmin. Single site mutations within the segment Asp355-Arg356-Pro357 of PAI-1 yield Gdn-HCl activatable inhibitors that can still form SDS stable complexes with plasminogen activators, with second order inhibition constants that are similar to the native inhibitor. Interestingly, the conversion of these mutants to latent forms was ~3–4 fold faster than wtPAI-1, suggesting that the Asp355-Pro357 segment is involved in maintaining the inhibitory conformation of PAI-1. Glu351 contributes to the optimal functional stability of PAI-1 and participates its conformational stability. More importantly, Glu351 of PAI-1 is a specificity determinant for uPA, thrombin and plasmin, but not for tPA. The following materials were obtained from commercial sources: native PAI-1, secreted into the cell culture medium from human fibrosarcoma cell line HT 1080 (Biopool); single-chain tPA and two-chain tPA standard (Biopool); uPA, plasmin and thrombin were from Calbiochem; the chromogenic substrate for uPA, pGlu-Gly-Arg p-Nitroanilide (S-2444), the chromogenic substrate for tPA and H-D-Ile-Pro-Arg-pNA-2HCl (S-2288) from Chromgenix AB, chromogenic substrate for thrombin, H-D-Phe-pipecolyl-Arg-pNA(S-2238) and chromogenic substrate for plasmin, N-p-Tosyl-Gly-Pro-Lys-p-Nitroanilide from Sigma); heparin-Sepharose, monoclonal antibody against PAI-1 from American Diagnostica, Inc.; recombinant N-glycanase (Genzyme diagnostics); the pRSET(A) vector, baculovirus transfer vector pAcSG2 and BaculoGold transfection kit from Pharmgen; Sf9 cells (Spodoptera frugiperda), High Five cell (Trichoplusia ni) from Invitrogen; Restriction enzymes, T4 ligase and shrimp phosphatase were purchased from New England Biolab. BCA protein assay reagent from Pierce; A full-length cDNA of human PAI-1 (pPAI-1-AI)  was generously provided by Prof. Keld Danö, The Finsen Laboratory. Plasmid DNA was purified using either Promega or QIAGEN miniprep kits. The DNA was sequenced using the di-deoxy chain termination reaction method using an ABI 373 DNA sequencer. Oligonucleotides were synthesized using a 380 B DNA synthesizer (ABI model). DNA manipulation techniques were carried out according to standard procedures . High 5 cells, grown at 27°C in SF-900 serum-free medium, were infected with high-titer virus stocks (1–3 × 108/ml). The medium was collected 48 hrs after the infection (found to be the optimal harvesting time for wtPAI-1) and then centrifuged for 5 minutes (125 × g). The supernatents (50 ml) were collected and sodium chloride (final concentration 0.25 M) was added. They were then applied on a heparin-Sepharose column (bed volume 5 ml) that was equilibrated and run (flow rate 20 ml/h) with a buffer consisted of 50 mM sodium acetate, pH 5.6, containing 0.25 M NaCl and 0.01% Tween-20. The columns were washed and the PAI-1s were eluted with a 40 ml gradient of 0.25 – 1 M NaCl in the same buffer. The medium of the infected cells and the elutent from heparin-Sepharose were separated on 10% SDS-PAGE, and monitored by silver staining. Fibrosarcoma PAI-1 and wtPAI-1 were transferred onto nitrocellulose paper and the proteins were revealed with anti-human PAI-1 monoclonal antibodies, followed by horseradish peroxidase (HRP) conjugated rabbit anti-mouse antibody, and enhanced chemiluminescence (ECL). 5 ug of Fibrosarcoma PAI-1, or wtPAI-1 was denatured by boiling for 5 min in a buffer consisted of 0.5% SDS, 50 mM β-mercaptoethanol and 50 mM Tris-HCl, pH 7.4. They were then digested (18 hr, at 37°C) with 0.5 units of recombinant N-glycanase in the presence of 2.5% NP-40, and subjected to SDS-PAGE and silver staining. Protein concentrations were determined by the Bio-Rad protein assay reagent. The inhibitory activities of fibrosarcoma PAI-1, wtPAI-1, and its mutants were measured by a direct chromogenic assay using uPA (100 U/ug) and its substrate S-2444 in a microtiter plate as described earlier . Briefly, fibrosarcoma PAI-1, wtPAI-1, or its mutants were diluted 1:10 in the activity measuring assay buffer (50 uM Tris-HCl, pH 7.5, containing 0.15 M NaCl and 100 ug/ml BSA). 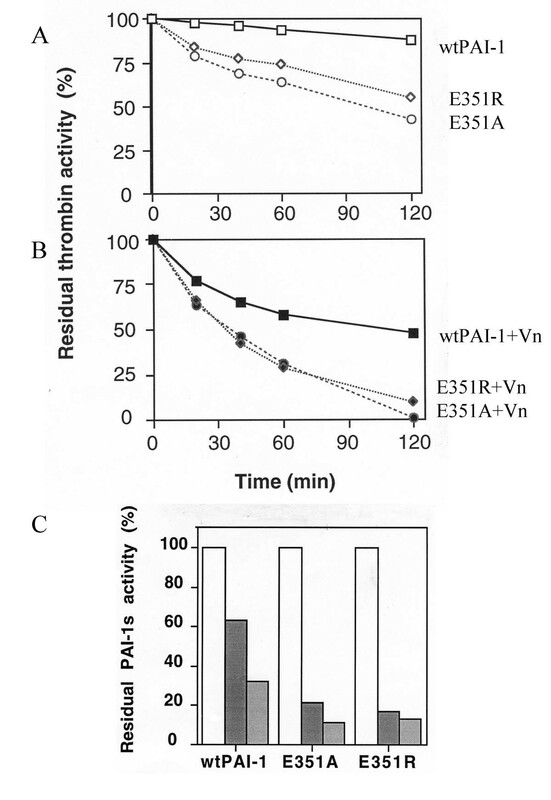 The PAI-1 samples were incubated in the absence or in the presence of a two molar excess of vitronectin (the fibrosarcoma PAI-1 and the wtPAI-1 were incubated with vitronectin) at 37°C. At the times indicated, aliquots were removed and analyzed immediately for their inhibitory activity. One unit of PAI-1 activity is defined as the amount that completely neutralizes 1 U of uPA. The specific activity obtained at time zero was assigned a value of 100%. The inhibitory activities of wtPAI-1 and mutants were measured by a direct chromogenic assay using uPA (100 U/μg) and substrate S-2444. Briefly, serially diluted wtPAI-1, or mutants were incubated with equal volume of uPA (50 μl, 50 U/ml) for 30 min at 37°C, followed by addition of 100 μl, 0.5 mM S-2444. Residual uPA activity was quantitated by measuring the change in absorbance at 405 nm with ELISA reader. The specific activity of PAI-1 was calculated based on the amount of uPA inhibited by PAI-1. The assay for PAI-1 inhibitory activity toward two-chain tPA was the same for uPA except that the samples were incubated with tPA and S-2288. PAI-1 inhibitory activity is expressed as the number of international units of PAs inhibited by PAI-1. Specific activity of uPA and two-chain tPA are 100 U/μg and 764 U/μg, respectively. For the functional stability, wtPAI-1, or mutants were incubated at 37°C. Aliquots were taken out at times indicated and analyzed immediately as described above. The specific activity obtained at time zero was assigned a value of 100%. To provide the evidence to support the conclusion obtained from enzyme assay, certain amount of wtPAI-1, E351R and E351A were incubated with equal amount of tPA at 37°C for 30 minutes before put on ice, at same time these PAI-1s were incubated in PBS at 37°C for 3 hours, respectively, before the PAI-1s were incubated with same amount of tPA at 37°C for 30 minutes, then the protein samples prepared at two time points were subjected to SDS-PAGE and western blot as described before. Thrombin (0.025 U), or plasmin (0.1 μg/ml) was incubated at 37°C for 30 min with same amount of wtPAI-1, E351A and E351R in term of inhibitory activity toward uPA (20 U in the concentration range of 4–10 μg/ml) in absence or presence of vitronectin (60 μg/ml). Linear increase of absorbance at 405 nm were recorded after adding S-2238 (final concentration 0.25 mM) for thrombin, or N-p-Tosyl-Gly-Pro-Lys-p-Nitroanilide (final concentration 0.5 mM) for plasmin. Thrombin, or plasmin activity without PAI-1 was taken as 100%. Complex formation of the fibrosarcoma PAI-1, wtPAI-1 or its mutants with single-chain tPA or uPA were performed as described earlier . Samples of PAI-1s (5 U) were incubated in the absence or in the presence of a 2-fold excess of uPA or tPA in the activity assay buffer. Following a 30 min incubation at room temperature, the samples were subjected to a 10% SDS-PAGE and immunoblotting as described above. This research was supported by the Israel Science Foundation, Award No. 415/99. S.SH was the Incumbent of the Kleeman Chair in Biochemistry. We are grateful to Prof. Keld Dano, The Finsen Laboratory, Rigshospitalet, Copenhagen, Denmark, for the gift of PAI-1 cDNA clone. We thank Professor Elizabeth Goldsmith, Dept. of Biochemistry and Internal Medicine, University of Texas Southwestern Medical Center, Texas, for providing the co-ordinates of latent PAI-1. Professor Shmuel Shaltiel sponsored and supervised the project and revised the manuscript.